Who doesn’t like a bowl of warm chili on a cold winter night? 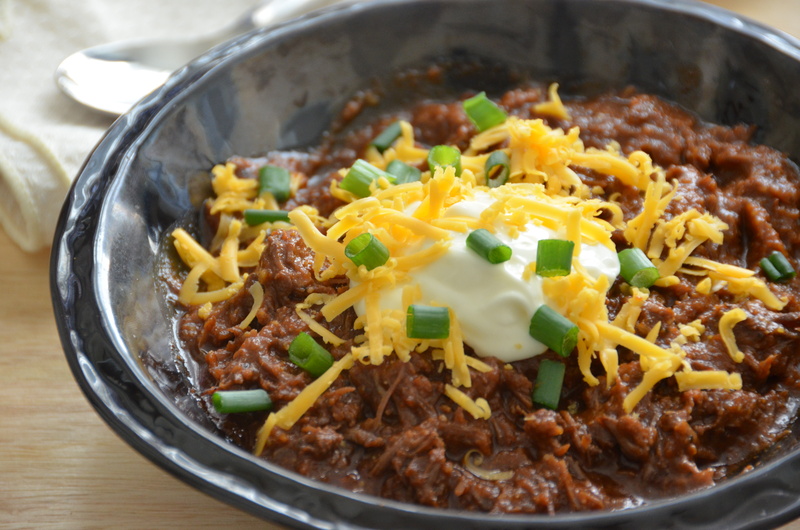 This chili has the perfect amount of heat and a little smokiness form chipotle. This chili is great on it’s own but you can also us the leftovers for tacos, pasta, and sandwiches. I hope you give it a try! Place chile de arbol in a bowl and cover with boiling water. Let steep for about 20 minutes until it softens. Once softened, place chili in the blender along with the jalapeno, chipotle, tomatoes, onion, and agave. Blend until smooth. Heat Oil in a large pot or Dutch oven. Season short ribs with salt and pepper and brown on all sides. Once all of the short ribs are browned, add paprika, cumin, oregano, cocoa powder, chili powder, and cinnamon. Stir until short ribs are coated. Add tomato mixture and beer and bring to a boil. Reduce heat and simmer short ribs for 2 hours covered. After 2 hours remove short ribs and shred with a fork. Discard ant fat and place shredded short ribs back in pot. Simmer until desired consistency is reached for an additional 30 minutes to an hour uncovered. I like my chili on the thick side, so I simmered it for about another hour. Once chili is done, remove from heat and stir in masa. Serve with your favorite chili toppings. This chili is great the days it’s made, but it taste even better the day after. This looks delish!! Will definitely give it a go! Yum, yum, yum. Chili without beans. It looks good and so versatile. I love the idea of it in a taco or on a sandwich. Thanks for the inspiration.